Montgomery Village PS Student Wins OSBRC Great Wolf Lodge Prize Draw! Home » News & Events » Montgomery Village PS Student Wins OSBRC Great Wolf Lodge Prize Draw! 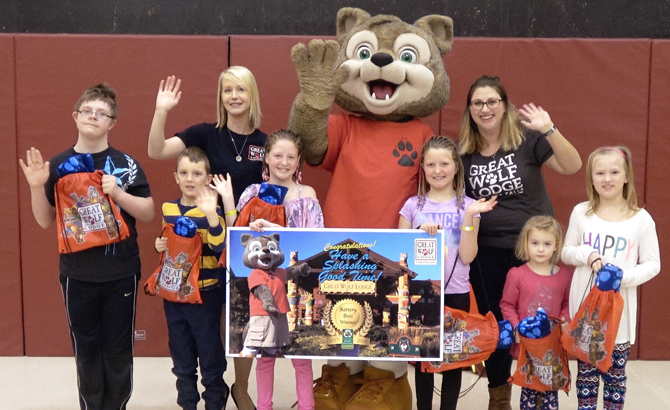 On February 26th, Sarah Lacharity of Raw Materials Company, along with her friend Wiley the Wolf stopped in at Montgomery Village Public School in Orangeville to present a grade 5 student named Jillian with a family stay at Great Wolf Lodge in Niagara Falls. Jillian was the winner of the 4th annual Ontario Schools Battery Recycling Challenge - Family Day prize draw. This special random draw is reserved for “Battery Bosses”, a name that acknowledges students that complete all five Student Missions during the Challenge year. This year, there were 138 Battery Bosses. Montgomery Village had six students that were eligible for the draw. Pictured above from left to right; Darby (grade 5), Ryder (grade 1), Jillian (grade 5), Jordan (grade 5), Claudia (JK) and Anika (grade 3). "I learned a lot about how to save the environment by doing all of the Student Missions and becoming a Battery Boss," said Jillian. This is the fourth year that Montgomery Village has participated in the Ontario Schools Battery Recycling Challenge. In that time the school has recycled more than 66,000 batteries, diverting harmful chemicals and reusable materials from local landfills. “We’re so proud of all of the students that took time to complete Student Missions this year,” said Sarah Lacharity. “We wish we could give all of them a prize, they certainly deserve it." At last count, students and schools participating in the OSBRC had recycled 36% more than they had at the same time last year, making it the best year on record. Since 2014, the OSBRC has recycled more than four million household batteries. The Ontario Schools Battery Recycling Challenge was created by Raw Materials Company, a battery recycling company in Port Colborne Ontario. The Challenge teaches children and their families about the proper way to handle and store batteries at home, all while promoting the benefits and providing an avenue to recycle them. The Challenge begins on the first day of Waste Reduction Week every year in October and runs until Earth Day in April. The Challenge awards the top schools across Ontario with a portion of the provincial prize pool and every year, 10% of that prize pool is earmarked for a donation to the SickKids Foundation on behalf of all OSBRC participants. To learn more about the Ontario Schools Battery Recycling Challenge, please visit www.rawmaterials.com/ontario-school-recycling-challenge/. Proceeds for the collection and recycling of the batteries are made available through the Orange Drop program that is funded by primary battery manufacturers. For more information please visit www.makethedrop.ca. Raw Materials Company is an industry leading battery-recycling company. RMC was established in 1985 and employs 50 people in the community of Port Colborne, Ontario. RMC is an approved transporter and processor under the Stewardship Ontario Battery Incentive Program.